Watercress soup is a great classic when it comes to French soup recipes as they grow an abundance of this lovely salad vegetable all over France. They make the most of it too as watercress is so versatile and the French include it in many salad dishes, quiches, soups and dressings. This recipe is for a very easy version of this soup and is an everyday occasion in French households. 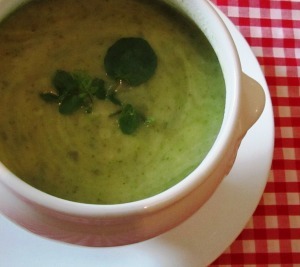 Basically it is very like the recipe for the leek and potato soup but a great big bunch of watercress is added to make a wonderful, green and healthy choice for family meals and of course it goes without saying - it is bound to impress everyone if you are entertaining. So, follow the recipe for the leek and potato soup – I have also included it below for your for convenience – and include the watercress. The recipe originally gives water as the basis for stock but here I would go all out for a good chicken stock as it is just heavenly with the flavor of a good stock. You can if you prefer use a good vegetable stock but if you have a good chicken stock ready or in the freezer made from traditional methods use this as your first choice. Another method is to use a chicken stock made when you poach a chicken – you have a good meal from the poached chicken then the next day the stock can be used in dishes such as this watercress soup. It is really very easy and gives you some very healthy nutritious meals all from one chicken. · Prepare the potatoes by peeling and cutting them into small pieces. · Clean and prepare the leeks, cutting into ½ inch (1cm) lengths. · Chop the watercress finely. · Melt the butter in a heavy bottomed pan. · Cook the leeks in the butter until soft. · Add the water, potatoes, watercress, salt and pepper to taste. · Cover and bring to the boil. · Reduce to simmer and cook for 1/2 hour. · Blend in a liquidiser. · Return to the pan and add milk. · Bring back to boil and reduce to simmer for a few minutes before serving. Garnish with sprigs of fresh watercress and serve with croutons or your favourite bread.